Found this news item and had to share. Can you imagine what his parents went through? And, fast forward 116 years to today, what a genealogist might go through? A Son Returns Home Whose Parents Thought He Was Dead. 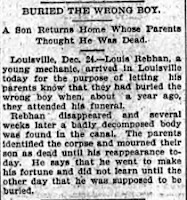 Louisville, Dec 24 -- Louis Rebhan, a young mechanic, arrived in Louisville today for the purpose of letting his parents know that they had buried the wrong boy when, about a year ago, they attended his funeral. I can only imagine that they were happy that he was still alive but oh the emotions they must have gone through! And, we've seen this in modern times to. I wonder if they had a tombstone erected during that time? I wondered the same thing, Gale.